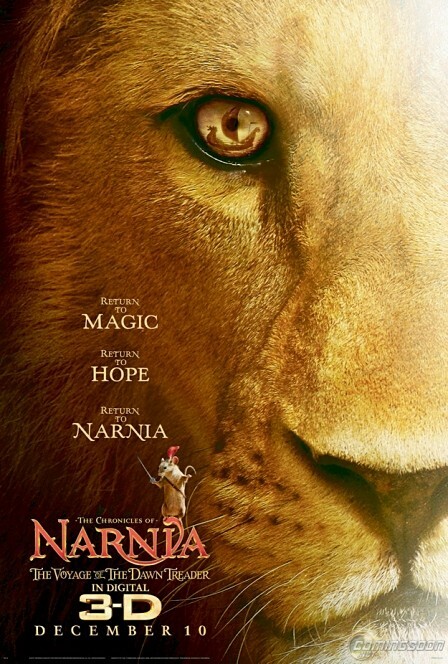 This is the magnificent first poster for The Chronicles of Narnia: The Voyage of the Dawn Treader, the third film from the books of C. S. Lewis. We can have a close up to the lion’s face, Aslan is back, and in his eye pupil we see the reflection of the ship, the Dawn Treader. The poster also confirms that the film will be released in 3D and its premier date will be December the 10th, 2010. (Spoilers) Lucy and Edmund Pevensie return to Narnia with their cousin Eustace where they meet up with Prince Caspian for a trip across the sea aboard the royal ship The Dawn Treader. Along the way they encounter dragons, dwarves, merfolk, and a band of lost warriors before reaching the edge of the world.